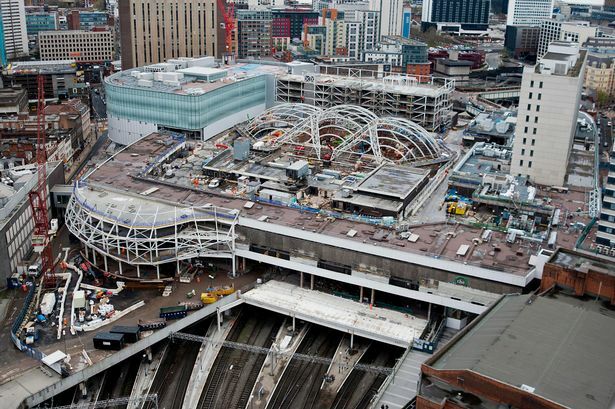 This impressive picture taken from the top floor of the Rotunda in Birmingham city centre shows how the new New Street Station is taking shape. Birmingham Post photographer Jason Skarratt captured the vast building site with a rare glimpse of the central atrium which will allow natural light throughout the station and to all 12 refurbished platforms. The atrium will be revealed in the summer of 2015. On the top left of the image is the giant John Lewis store, which will be the anchor tenant of the Grand Central retail development when it opens next year, and will be joined by more than 40 high street stores and 20 new cafes and restaurants. John Lewis is investing a total of £35 million to launch the new 250,000 sq ft shop, which will be one of the largest outside London, stocking more than 350,000 products and creating 650 jobs. The £600 million station revamp recently hit the headlines when architect Alejandro Zaera-Polo, who quit design work on the station, told of his “complete disagreement” with Network Rail over changes to its design and materials used.